Being pregnant is a unique state, where everything feels a little out of place, a little looser, and a little tighter at the same time, thanks to those wonderful hormones. As a strict stomach sleeper, if there is something I’ve missed more than anything (even more than wine) is laying on my stomach. My back and hips can get achey, and trying to sleep on my sides looks a bit like a not so gracious seal on dry land trying to make it back to shore. When Tummy Cradle reached out to us and asked if we would like to review their new face-down pregnancy pillow, I jumped at the chance. Even if just for a quick nap, watching a show, or working on my computer, this was nothing like any other pregnancy pillow I’d seen before. So lets break it down. Tummy Cradle was developed by a team of chiropractors who heard women complain over and over of the same pains, and set out to create a pillow that relieved key pressure points. Sounds amazing, right? 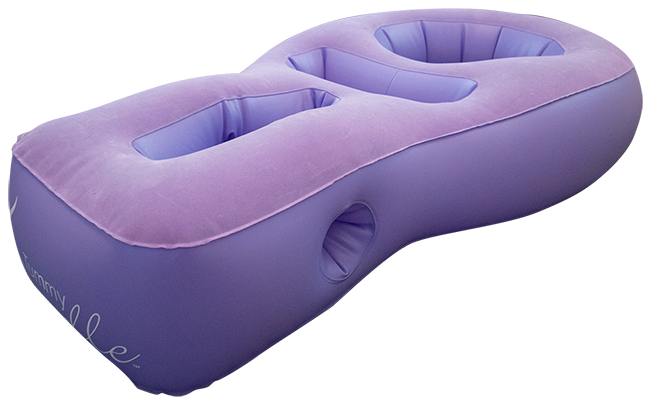 Even better, it is a full-size inflatable body pillow that you can take with you anywhere, and allows you to comfortably and safely lay completely face down, perfect for when you need a 20-minute break from that heavy third trimester belly putting pressure on your lower back. It works by realigning the spine and taking the weight off the points that really hurt, allowing for better blood flow and overall relief. The way it is shaped allows for every curve to be hugged, with spaces for the belly, chest and face. It helps your whole body to feel weightless by propping up the hips and upper body and letting the belly hang down like a comfy hammock. It works very well for realigning an achey back and spine. Overall, this unique pregnancy product is going on my personal must-have list, along with prenatal yoga classes, chiropractic adjustments, and coconut water by the gallons. Getting comfortable can be a challenge the further along we get, and I am taking advantage of all options available to help relief the aches and pains!